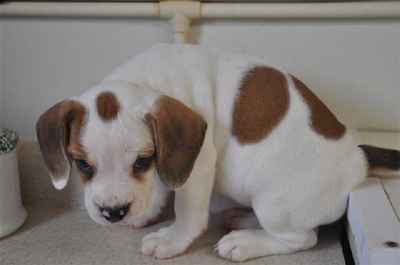 The Beabull is a designer dog achieved by crossing a Beagle with a Bulldog. This new breed is gaining popularity due to their attractive appearance and delightful nature. It is an unpredictable breed for appearance as each dog may vary from another depending on the parental genetic contribution. 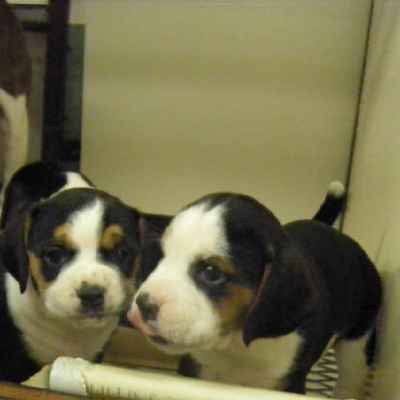 Most come with the Bulldog wrinkles and underbite, while the floppy ears and the long muzzle are attributed to their Beagle parent. The Beabull is a friendly and patient dog with children and other animals including dogs. They are intelligent and even tempered, although they can have a streak of stubbornness from the Bulldog side. While they are not very active dogs, they will enjoy a game or walk to burn off their energy. Loveable and loyal, the Beabull is gaining a good following who love the mischievous affectionate nature of this dog. The Beabull needs to be brushed almost daily. Going over them with a firm bristle brush and a vacuum, and then a wipe over with a damp cloth will keep them (and your house) looking its best. Bathing is on a need only basis, and it is advisable to use a special dog shampoo, taking care to clean and dry carefully in the wrinkled areas to prevent skin infections. They are not hypoallergenic because of the amount of hair they shed. The Beabull will love the attention of grooming but make sure you get them used to having their teeth cleaned and nails clipped at an early age. A lot of dogs don’t like their feet being handled, so getting them used to this when they are a puppy will help during veterinarian handling issues as they mature. Because they have long floppy ears, they will need to be cleaned out by wiping with a damp cloth once a week, just to remove any debris that may have worked its way into the ear. Normally the Beabull is a calm and docile dog, friendly to all and very loyal. 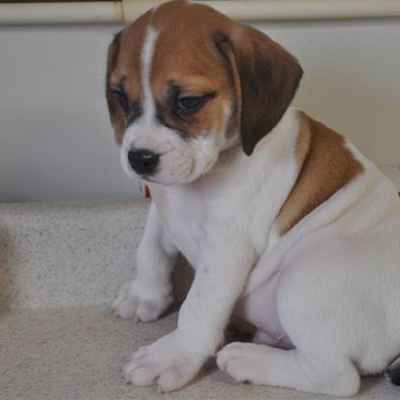 However, the Beagle and Bulldog have an obstinate trait that is also found in the Beabull in varying degrees. It can take patience and perseverance to train them, but is helped by reward treats of food which they love. They are friendly towards children and can show amazing levels of patience with curious and sometimes annoying youngsters. The Beabull puppy is full of life and needs plenty of activity to wear off its energy, or it can become destructive and chew on everything and anything. The Beabull cherishes its master and family, loving nothing better than following them around all day, then curling up on or beside them in the evening, and they love to be lavished with attention. While they are not the best watchdog because of their friendly nature, they would not hesitate to defend their family if the occasion arose.